It’s that time of year again…Back to School! I’ve got a really fun diy easy lip balm recipe below that is super easy, inexpensive and a really fun craft for the kids. This is a really easy activity that you can do alone or with the help of your kids. The first thing you need to do is place the 1 cup of petroleum jelly into the microwave for about 1-2 minutes or until smooth and easy to stir. You do not want to over heat the jelly onto a liquid. Just heat it up until it’s easy to mix. 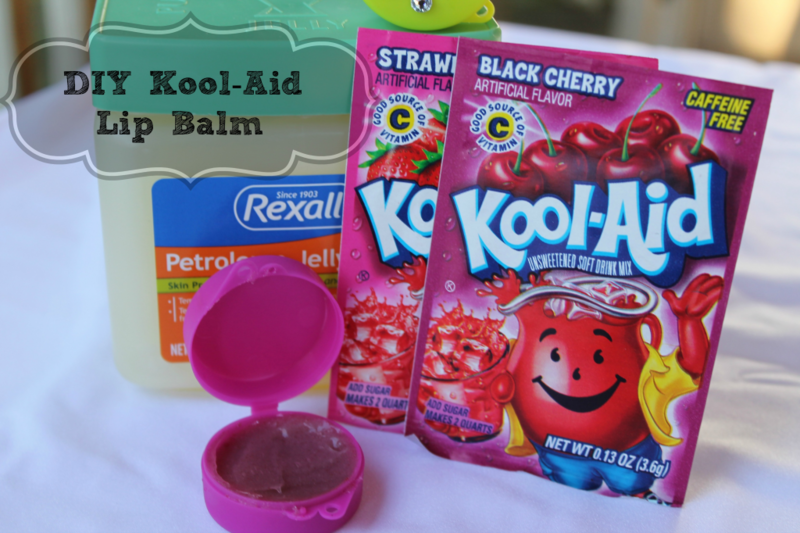 Next, add a packet of your favorite flavor Kool-Aid to the petroleum jelly. You can add as little or as much as you want. The more you add the darker your lip balm will be. If you want to add a little sweetness to your lip balm you can mix in a packet of sweetener such as Splenda. After the jelly is mixed up it’s time to put it into your cute little containers. Smooth the top and then place in the fridge for at least an hour. I left mine over night. Decorate your containers with stickers, labels or whatever your feel like! I never would have thought to do that! What a fun idea! How fun! I never knew there were so many fun things to use Kool-aid for, besides drinking! Question though…does it dye your lips at all when used? I think it would be helpful with a red…but not so much with a blue. Know what i mean.? lol.. Thanks for this great idea! I’m addicted to lip balm so this seems like a frugal way to make some! Strawberry Kool Aid is the best! I like grape – thank you. Our favorite is tropical punch. You can mix and other flavor with it and…delish! Kool Aid Lip balm? Now that’s a first. My favorite flavor of Kool-Aid would definitely have to be Grape, it’s SO good! my favorite was the cherry singles flavor powder pouches, liked how it turned my moth red. Orange has always been my favorite. Thanks for the chance to win! I like the Tropical Punch flavor! My favorite would be tropical punch, but we rarely drink individual flavors. We usually combine two flavors in a gallon jug. The kids like to fight over which flavors to use. The combinations are endless. I love cherry it’s my favorite fruit flavor my boys like it also! It is actually lime that I have enjoyed since I was a kid. Everyone in my house has a different favorite flavor. Mine is Pink Lemonade. Oh my favorite flavor is the Blue Raspberry ! Cherry Kool Aid is my favorite. Black Cherry and Grape were always my faves!! Blue raspberry is my favorite flavor! I love Cherry, but there really isn’t a flavor I don’t like! My favorite is grape. Thanks. I know this is a really old post but im planning on making some but i wanna know how black cherry would look on lips? Im pretty light.